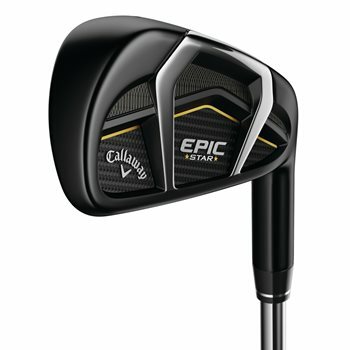 The Great Big Bertha Epic Star irons deliver epic performance in an ultra-premium lightweight package. The next generation 360 Face Cup technology promotes even more ball speed on center hits and further minimizing distance loss on off-center hits while the Exo-Cage head construction stiffens the body to allow the face to take on more impact-load and raises the COR close to the limit in each iron, promoting faster ball speed for longer distance. Incorporating tungsten in the Internal Standing Wave allows precise CG positioning in each clubhead: Lower in the long-irons for easier launch and long carry; higher in the short-irons for a lower, more controllable flight. The Epic Star irons dramatically enhance distance and accuracy with a remarkable combination of industry-leading ball speed technologies, low-deep CG locations, multi-material construction and an ultralight component package.